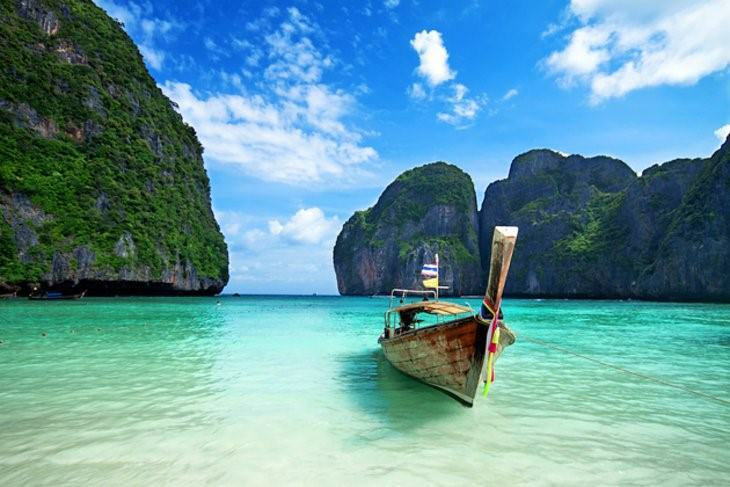 What are you most excited about as you plan your trip to Phuket? Maybe it’s the amazing food, stunning beaches, booming nightlife, or various attractions and experiences you can immerse yourself in. It’s hard to decide what you want to do when you have a limited number of days. You want to do the activities you enjoy but you also don’t want to miss out on must-see or do attractions and activities. This piece will serve as a guide to Phuket’s most amazing attractions. No matter what your time or budget constraints are, you can’t go wrong with any of the attractions! When you see the bay, you’ll be blown away from the towering karsts made of limestone that shoot out of the water whose color reminds you of emeralds. The best way to get to the bay is to book a boat trip from Phuket. The boat trip takes the less crowded route to the James Bond Island and Koh Panyee. The James Bond Island is home to a renowned landmark named Koh Ta-pu, which was featured in the James Bond movies. The rock formation is a site to wonder at; however, the boat tour isn’t complete without a stop in Koh Panyee, a fishing village. Koh Panyee is a lovely fishing village, which is entirely built on stilts over the water surrounding by karsts. While fishing was the primary economic source, tourism has now taken over. The village has built restaurants among its huts and shack to support it touristic economy. If you’re more interested in seeing the limestone karsts or cliffs close-up, there’s an option to do that as well. You can book a boat tour that also allows you to Kayak into one of the famous limestone caves. Bangla road is known for its vibrant nightlife that offers something for everyone. Once the sun sets, the road is closed off for vehicles and it becomes a party of lights, music, and affordable drinks. Although it does become crowded, it’s actually quite a friendly place to wander around at night as you pass the competing bars and clubs. The bar’s music spills out its front doors and mixes with other one’s music as well. The streets are mostly lined with beer bars, but you can also find disco and go-go dance parties to keep you moving and grooving all night. Just take a walk and see what you like. Seeing this colossal-sized statue of Buddha is one you can’t miss due to its enormity and one you need to see up-close. The Big Buddha statue is most critical and respected sites on the island to the locals and Thai culture. The grandness and beauty of Buddha’s 45-meter statue will humble and have you in awe. At the statue, you’ll be immersed in a peaceful and quiet atmosphere. The only sound you’ll hear is from the bells and flags blowing in the wind. After you’ve been dazzled by the site of the statue, you walk around the base of the statue and then gaze at the seizing views of Phuket Town, Kata Karon, Chalong, Bay, and many more sites. Phuket is home to more than thirty beaches all outstanding with their distinctive atmosphere, landscape, accommodation, and even sand types. With such a large selection on your hands, it’s hard to choose which one is the “best” one. It depends on what you want out of your day or days at the beach. Kata beach with its relaxed atmosphere is home to surfers and snorkelers. At one end, it has longtail boats with a few budget-friendly restaurants. And, at the other end, hotels line the beach with more amenities. Freedom beach is only 300-meter-long with the whitest sand you’ll only find there. You can find peaceful quietness here without jet skis and vendors who walk around other beaches. You’re not completely alone, there is the occasional restaurant or snack shack along the beach. Ya Nui beach is another small beach stretching only 200-meters in an L-shaped bend. It’s renowned for its wondrous sand and sea color and of course its scenery. It’s just below the Windmill point of view. Going to one of Phuket’s night markets is where you can find deals and bargains on bizarre and marvelous trinkets and other mementos. Going to the night market after a day at the beach is a great way to keep the festival atmosphere going. Among souvenirs, you’ll also find savory food vendors and street performers. Here is your guide to Phuket, Thailand! I’ve covered everything you can want from a tame, cultural or party trip. Add what your favorite part of your Phuket trip was in the comments! Author Bio: This article is written by Paul Young in support Phuket Ferry.